Everything is coming up roses when you indulge in the fragrant and moisturizing pleasures of this dynamite duo. With the velvety, sweet essence of rose buds, these luxuriously hydrating beauty treatments add an invigorating and pleasurable dimension to your personal care regimen. Ingredients: Water (Eau), Cetearyl Alcohol, Prunus Amygdalus Dulcis (Sweet Almond) Oil, Glycerin, Dicaprylyl Carbonate, Helianthus Annuus (Sunflower) Seed Oil, Coco-Caprylate/Caprate, Squalane, Dicaprylyl Ether, Butyrospermum Parkii (Shea) Butter, Persea Gratissima (Avocado) Oil, Cetearyl Glucoside, Fragrance (Parfum), Ceteareth-33, Xanthan Gum, Phenoxyethanol, Benzyl Alcohol, Imidazolidinyl Urea, Potassium Sorbate, Lactic Acid, PEG-8, Alcohol, Tocopherol, PEG-40 Hydrogenated Castor Oil, Ascorbyl Palmitate, Rosa Canina Fruit Extract, Pyrus Cydonia Fruit Extract, Vitis Vinifera (Grape) Seed Extract, Ascorbic Acid, Citric Acid. Smells wonderful, makes skin soft. 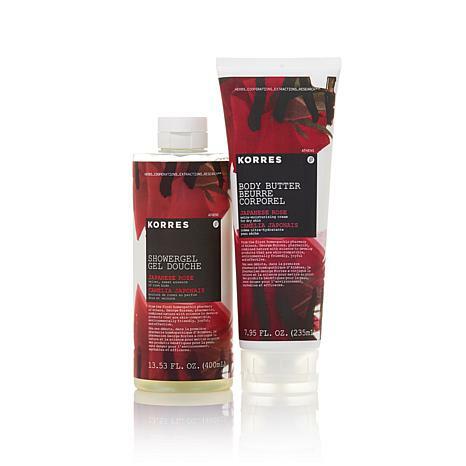 I have been buying a lot of Korres and I think it is the best product ever. I could sell this myself. It smells great and is a big help with dry skin.Thank you Korres and what can I say about HSN overall....bar none the best shopping channel ever!! I have been using Korres products for about 5 years. Ilike the shower gels and the body butters a lot. They really keep my skin hydrated. My skin seems smoother also. The Japanese Rose scent is mild. It`s not my favorite, so I may give it as a gift. 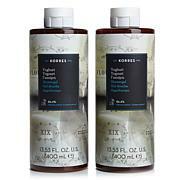 I will keep using Korres products. I have 3 orders from the specials on Tuesday and today! Can`t wait to get them. Two I`ve had before and one is new.